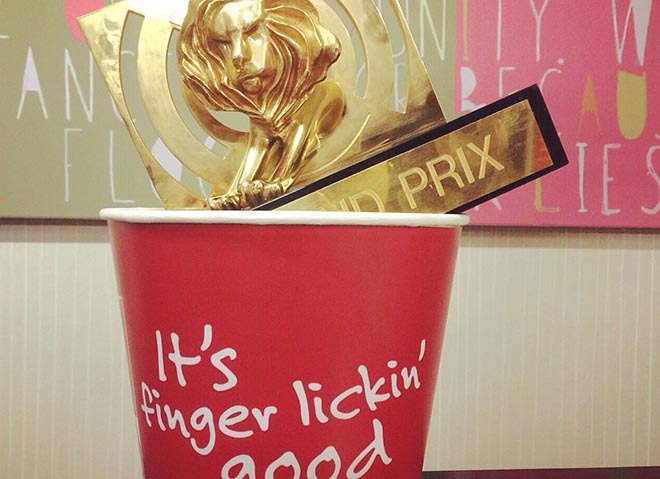 Ogilvy Johannesburg’s radio advertising campaign for KFC South Africa, “KFC Man Meals”, has won the Radio Grand Prix at Cannes International Festival of Creativity, following on from the recently awarded D&AD Yellow Pencil for Radio. The sad fact is that guys who like cocktails are afraid to admit it because they are branded unmanly. KFC is the great equaliser. Everyone from every walk of life can be found in a KFC store. So KFC Man Meals would like to challenge norms and conventions of what it means to be a man, as well as show you that every man can enjoy the wonderful taste of KFC Man Meals. You can like Barbra Streisand and still be a man. You can drink cocktails and still be a man. KFC Man Meals are not just for burly hammer wielding jocks, it’s for every man. Three radio commercials “Coloured Weights”, “Claw Thing” and “Cherry Lip Balm”, take us through tested perceptions of manhood. The KFC Man Meals campaign Ogilvy & Mather Johannesburg by chief creative officer Pete Case, executive creative director Mariana O’Kelly, creative director Molefi Thulo, art director Tammy Retter, copywriter David Krueger, radio producer Alison Ross, working with KFC brand directors Mike Middleton and Thabisa Mkhwanazi. The ads were produced by sound engineers Louis Enslin and Theo Potgieter with voice over artist James Alexander.